In Melbourne and elsewhere in Victoria, kids reptile parties are an insanely good way to entertain children in Melbourne. This is for several good reasons. Firstly they are an affordable way to entertain and educate kids of all ages and culture. Most importanrtly in Melbourne, they can be held regardless of the weather. The party can be indoors or out and the entertainer can even do their work in very confined spaces. In other words if you are thinking about what to do to entertain the children at your next birthday or party event, then a reptile party seems like one of the best choices around. While people think of snakes, lizards and crocodiles as being dangerous animals, the reality is that nothing could be further from the truth. As a rule these critters are small and innocuous and most really don't want to bite anyone at any time. The dangerous kinds just don't get brought into people's venues for kids parties. That much is something you take for granted. The only exception to the preceding is for the ultimate reptile party show where you may see the world's deadliest snakes in your own lounge room and in total safety. But perhaps I should also add that when this happens it will only be with the snake man and his show and his snakes have all been surgically devenomized and so as mentioned already are totally safe. The guarantee of safety is absolute and watertight! 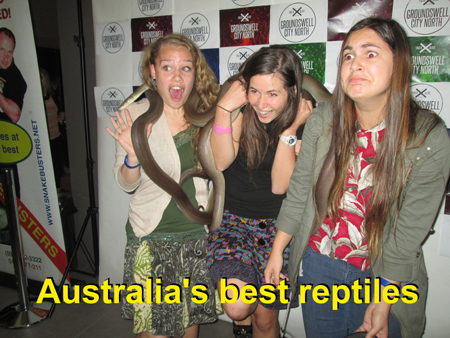 Of course in an entertaining party setting nothing wows the crowd as much as a reptile handler free handling masses of the world's most deadly snakes, such as brown snakes, tiger snakes, taipans and death adders. While there are many reptile shows doing kids parties not just in Melbourne or Victoria, but pretty much everywhere else as well, there is only one company in Australia that is hands on and lets the kids or the adults hold the animals. This of course is the parties done by the snake man Ray Hoser and his magnificent team. They operate out of suburban Melbourne but travel widely, the only constraint being that the more they have to travel, then the more they will charge for their services. While most of their party work is confined to Melbourne and nearby areas, Hoser as seen on TV has been known to travel to remote parts of Australia and even beyond Australia's shores to educate people about reptiles and snakes. This is not surprising as Hoser is the world's leading snake expert. He has named more species of snake than any other living scientist! Getting back to the kids reptile party event, most of the time it runs for about an hour in terms of entertaining the kids. The usual limiting factor being the attention span of most of the kids (or adults) and other constraints such as the need to feed the guests, other entertainment activities and so on. It is only on rare occasions the time-line of the reptile display may go way below or above the one hour time slot. Typically reptile parties are charged at a single party rate, which is usually for the party and not time as such. That is assuming it is within reason. 90 minutes would land within the party rate, but if you wanted the reptile handler to hang around for a number of hours or you had a group of several hundred people to be educated, then you will almost certainly be paying a higher rate than the minimum fee. A typical reptile show will also include snakes, lizards, crocodiles, frogs and turtles. The better reptile shows will have the venomous snakes, but of course unless they have been devenomized, (we call them venomoids) they really are too risky and too dangerous to have in public, or for that matter in thre privacy of your own home. Some less experienced reptile displayers unable to display venomous snakes will try to pad their show out with other wildlife, such as possums, birds, octopus, gliders, wombats, or even penguins, but none cut the ice when compared to the deadly snakes. They just don't have the same wow factor! So too many show and tell type of animals will lead to a bored audience and the kids attention going elsewhere. The same issues applies for adults as well. In other words for most people the best educational reptile party in Melbourne is the reptile parties that let the kids hold the animals and where the birthday child be the star of the show. Anything less really isn't the real deal. By the way, the money spent on the day, while a little more than for other party entertainmeners, will be forgotten long after the educational experience remains foremost in your mind and those of your best friends. Reptile parties is one of several registered trademarks owned by Raymond Hoser, the best known snake handler in Australia..